In a sort of inverse to spring cleaning, am shedding leaves (of paper) and mulching (metaphorically) garments as autumn descends. Have treasured letters from lengthy correspondences with friends near and far. Prior to the ease of email the arrival in the post of an airmail envelope and a foreign stamp generated excitement and warmth. Leaves of paper were handwritten then folded, traveled a distance to where they were unfolded and the words slurped up. Glorious. Undeniably there is ample room in a lifetime for a multitude of friendships. These collected letters are cobblestones along the path. A celebratory bonfire is more appropriate than a dustbin. These qualities in mind, have discarded some clothing and made more lingerie. It is early morning. The pleasant fragrance of toast from a neighboring apartment wafts in. Birds that have yet to migrate are chirping in a community of song. It is a less riotous sound than a summer morning brings. Bra and birdsongs, the foundations of a day? Fancied new lingerie. Lace. Was headed to the Garment District. En route popped into a textile trade show. Looked at neatly displayed samples of lace in a manufacturer's booth. Chatted with the sales representative (about laundering the lace, its elasticity). The three day expo was closing. She and her colleagues had hundreds of samples to pack. She spontaneously offered that I should take samples of the lace to try. Thought about which pieces would be useful. Chose a swatch of wide white galloon lace. (Galloon lace has a decorative scalloped border along the top and bottom edges.) There was a black piece too--both with stretch. Perfect for lingerie! Barely any scrap of white lace remained once it had been patterned, cut and sewn. Combined the black lace with cotton for a different style. Buying has its merits, yet there's an intangible joy in making. With a desire to share the benefits was practically singing, "I want to teach the world to sew...(tra-la)." Yesterday passed by a stoop sale. A seven year old boy was pleading with his mother (who was selling the wares) to let him go to the corner deli to buy lemonade. She was explaining to him that he was too young to go on his own. An hour later walked by the stoop sale on the way home. The boy was drinking lemonade from bottle with a straw. He was smiling widely, his grin extending on both sides of the straw. His mother had relented. To the boy that lemonade must have tasted better than any other. It was flavored with independence. To make what one wears has a similar essence. More than a decade ago after a year of searching from afar for an apartment in New York City that fit my budget, moved sight unseen into a tiny, tiny sublet in SoHo. It looked out over a churchyard providing a view of sky and trees, and against its amber-hued brick wall, of photoshoots with fashion models posing for photographers. Within hours of arriving in the city had found a job. Early that evening walking along Lafayette Street joyful and reflective, urgently wanted to write about what I'd come to understand that day. With everything in boxes, had left the apartment with neither a pen nor paper. What to do? Turned toward a woman who was walking along the same stretch of pavement. "Pardon me," I began and asked whether she happened to have a pen or pencil to lend momentarily--and oh, a scrap of paper? Explained that I'd an idea I wanted urgently to write. She rested her large messenger bag on the trunk of a parked car. From the bag she extracted a fresh yellow legal pad and a pen. "Keep them," she said handing them to me, "I know how that is!" As ideas churn, will draw or write on any available paper--the back of a business card or receipt, a random flyer, in the margins of a newspaper or the inside of an envelope. Began recently to carry a 3x5 pad of post-its. Sketches made at various times are easily assembled later into a group. Am playing with ideas for an Edwardian corset now in progress. A Victorian corset. Gradually almost all the overhead lights in this lovely brownstone flat ceased to function. Practically a Victorian night scene: hand-stitching the corset binding by lamplight, wearing a long chemise and a woolen shawl. Amused. Began by making hats. Then underwear. Now there's a mini-stack of underwear in the closet and a hall tree with hats by the front door. 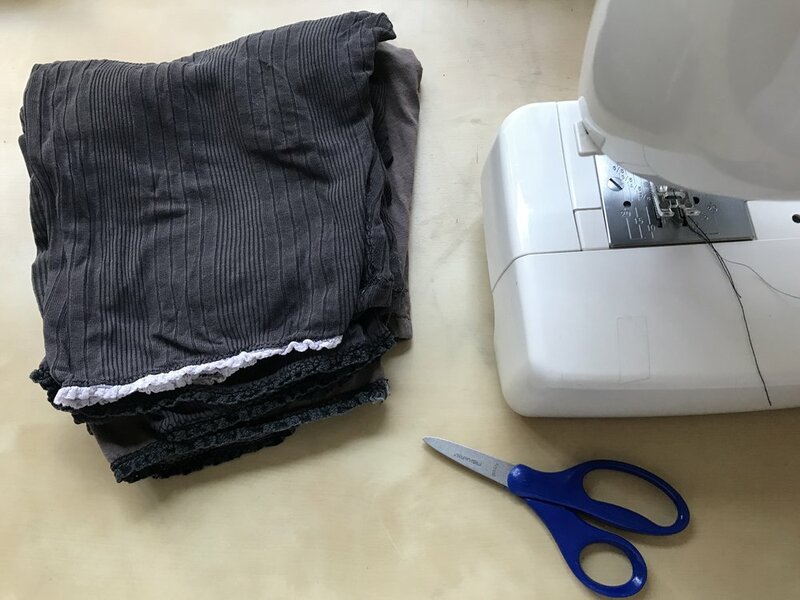 It is happiness-inducing to begin getting dressed each day with handmade underwear! These are from different years--the deep purple from the initial year, fuschia made last year and printed silk jersey undies assembled this winter using fabric salvaged from cutting long underwear tops. I've a dear mother who is both loyal and critical. (It is criticism in a constructive vein, she'd insist.) She's worn a silk top (photo, with matching undies) since it was made for her and phoned to ask whether I'd sew her another. High praise indeed! With its warmth and absorbency, silk is beneficial in winter. And when grey skies, shorter days and lower temperatures might lead to the doldrums, the sleek, airy luxury of silk provides elegant armor. Was cold in the studio yesterday. Over the summer I'd drafted a pattern for a camisole/undershirt. Having made a number of these in summer weight fabrics it was pretty simple to sew one in light, soft merino wool. There is shirring at the center and the fabric drapes away from the body at the waist. Wore it home! Thoughts about this project are evolving. More about this to come. Am for now writing and drawing ideas. This winter was a cold one! Have been reading pioneer era literature (children's, young adult and adult) with descriptions of winter and the layers worn to preserve warmth. Winter has been inspiring me to make undergarments. Left to right: boy shorts, camisole, bloomers, long underwear, slip, bra. Why did garters go out of fashion? Tights, which replace a garter and stockings, are aptly named. The solution: modernize! Plush garters are sewn to a band of gentle lace and soft jersey with an adjustable hook & eye closure. Here is a modern garter belt. The little bow in the front was a last minute consideration. It is a small detail yet it seemed to balance the design. The handmade wardrobe needed a camisole. Gathers at the center front for shape. Cross the back straps. After sewing the set, I happily discovered there was fabric enough for a second top. The silk jersey can wait!